Our state is in a jam. Unless drastic action is taken, the State of Ohio could find itself going the way of California – issuing IOUs in the place of paying its debts. Backed into that corner, Governor Strickland and the General Assembly have finally given in to the powerful gambling lobby and agreed to allow several very "lucky" horsetrack operators to add video slot machines to their repertoire of gaming choices. In announcing that decision, the Governor said "We have reached a final agreement on a budget that is not only balanced, but invests in education without raising taxes on Ohioans." However, as reported by The Columbus Dispatch in their July 11, 2009 story, the education community pointed out that the Governor was continuing an old shell game in regard to education funding. Remember how when people of Ohio were being sold on the idea of a State Lottery, the big selling point was that the profits would go to support our schools? It turns out that while indeed all the Lottery profits are wheeled in the front door of school funding, a nearly equal number of dollars are sneaked out the back door to fund other priorities. The net effect is that education gets no new dollars. The same game is being played with this video slot machine scam. Except this time Governor Strickland is pulling a new strategy – telling the truth, kinda, and only after the fact. "The difference between what we're suggesting and what has happened in the past is that we're being fairly candid about what we're going to do." In other words, it's okay if prior to the decision the truth was distorted (ie – implying that the new tax income from these video slot machines would generate additional money for the schools) as long as after the decision is made the truth comes out, if someone bothers to ask. This whole thing about the video slots stink. The voters of Ohio shot it down four times. The Governor said during his campaign that he was against expanding gambling in Ohio. Yet when things got tough budget-wise, he ran right to the arms of these seven track operators and gave them a monopoly on the market they've always wanted. If you're going to have video slots, why restrict it to just these seven operators? Don't other Ohio businesses deserve a chance to supplement their revenues with video slots as well? 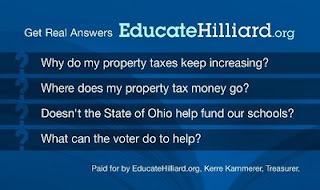 EducateHilliard.org is a non-partisan group of residents and business owners in the Hilliard City School District working for the preservation of our excellent schools through sustainable economics. I'm proud to be one of the founders of this group, and excited about being one of our candidates for School Board this November. I am joined by Don Roberts, a family law attorney and father of three, and Justin Gardner, an accountant and auditor, and a brand new parent. SaveHilliardSchools.org will continue as the place where I post longer stories about things that alarm me, or aren't making sense, about the leadership of our schools. EducateHilliard.org will function primarily as our campaign website, structured to make finding information easy for folks we're just getting to know. We are not alone in this kind of community activism in regard to schools. You are invited to visit EducateWorthington.org and Citizens for Fiscal Responsibility and Accountability (New Albany) to learn what folks there are saying about the way the leadership of their schools are failing their communities.